A special edition Mac Pro designed for the Product (RED) program was expected to bring in bids between $40,000 and $60,000, but the final "hammer price" reached an astounding $977,000. 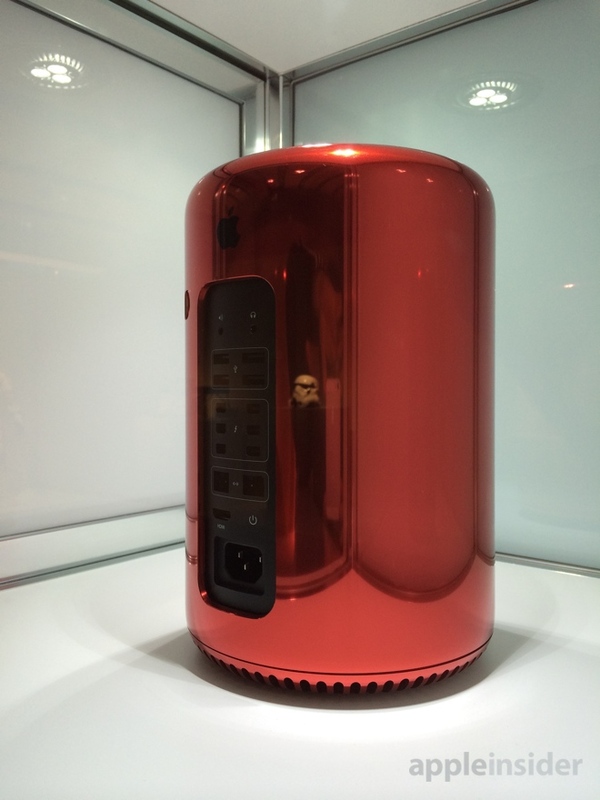 Designated as Lot 27, Apple's Mac Pro in a special red finish was auctioned by Sotheby's today to benefit The Global Fund to fight AIDS, Tuberculosis and Malaria. The nearly $1 million dollar winning bid makes the Mac Pro the most expensive desktop PC ever built or sold, a wide margin ahead of novelty machines created by Japan's Zeus Computer, built from platinum and gold, with moldings embedded with diamonds and priced up toward $750,000. A pair of rose gold Apple Earpods that sold for $461,000; a 1966 bottle of Dom Pérignon housed in a red cooler auctioned for $93,750; a custom designed Leica Digital Rangefinder Camera that fetched $1,805,000 and "The (RED) Desk," which was sold for $1,685,000. Earlier this week, AppleInsider was able to take a "hands-off" look at the collection. Apple's new Mac Pro hasn't yet been made available to the general public; the company says the new Mac Pro will become available next month. The standard black version of Apple's new high end desktop system will be priced starting at $2999 for the base model, with a second tier of performance beginning at $3999. The new Mac Pro is powered by an Intel Xeon E5 CPU with up to 12 cores, and standard dual AMD FirePro GPUs, packed in cylinder with a 6.6 inch diameter and cooled by an innovative, central thermal core designed to wick heat away from the primary processing chips for evacuation out the top. Apple detailed the new Mac Pro's design process in a video it presented at its iPad event last month (above). Apple's head of operations Jeff Williams explained, "To make a product as advanced as the Mac Pro, we had to pioneer entirely new processes."